Product prices and availability are accurate as of 2019-04-18 03:28:34 UTC and are subject to change. Any price and availability information displayed on http://www.amazon.co.uk/ at the time of purchase will apply to the purchase of this product. See note below regarding price options. 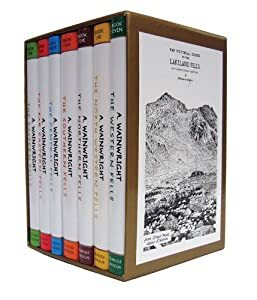 For the 50th Anniversary of Alfred Wainwright's "Pictorial Guides to the Lakeland Fells" the 1st edition volumes were produced in a new facsimile edition. Even though the 2nd Revised edition has now been available for many years, and a 3rd edition is in production, many Lake District enthusiasts like the original format and cover designs. It does not make sense to use these volumes out of the fells unless you know that your particular walk of the day has not been affected by landscape and path changes over the past sixty years. On a bookshelf and in the armchair, however, it is a different matter. You might like these. The boxed set here contains the original seven volumes. It is shown above at full price. This is not, however, the kind of bookshop that will take every last penny from you when you can get the item much cheaper. My advice is to click the Buy from Amazon button above and then, from the Amazon page to which you are taken, look for dealers offering New sets at prices considerably below this. You should be able to get a box set for between £30 and £40. Alternatively you may prefer a 2nd Revised Edition Boxed Set. 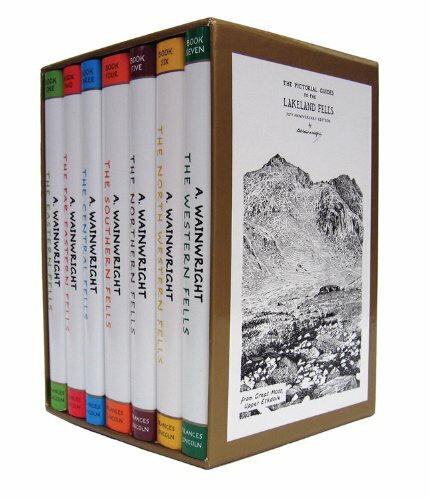 Boxed set of the Anniversary edition of all seven of A. Wainwright's Pictorial Guides to the Lakeland Fells. No changes from Wainwright's original texts and maps.